Master bedroom additions can be similar to building a small home. However, if your family is growing such that your home’s bedroom situation is cramped then a master bedroom addition, or even just a child’s bedroom addition maybe the right solution for you. Selling your existing home and buying a larger one is typically more expensive than adding on a master bedroom addition. Plus, building a master bedroom addition allows you the opportunity to develop your own custom master bedroom plans, with a master bathroom suite and walk-in closets if you so choose. Master bedroom additions can vary in complexity depending upon your specific home addition requirements. However, as with any home addition, it is similar to building a new home and as a result a great deal of upfront planning is required prior to breaking ground. Master bedroom additions can be as simple as a room addition with a closet, or as complex as a mother-in-law suite or master bedroom suite. Master bedroom additions can also double as office and den space or even as a recreation room. The very first home addition that I was involved with was way back in the 1970’s and consisted of a large master bedroom addition that attached to the back of our ranch home. The master bedroom addition was installed on a concrete slab and tied into the back corner of the existing home to create an L-shaped ranch. Though we did not put in a master bathroom suite I remember installing a large walk in closet with his and her door entrances and cedar paneling. At the time it was a pretty fancy master bedroom addition, however things have changed over the past few decades. Today’s homebuyers typically like to see a master bedroom addition with a large master bathroom suite that has at least a whirlpool spa tub, and preferably a separate custom ceramic tile shower stall. If your master bedroom addition plans do not include a new bathroom then a significant amount of costs savings can be achieved. A master bedroom bathroom suite or mother-in-law suite not only necessitates the need for a larger bedroom addition, but also the need for plumbing and plumbing fixtures. Plumbing contractors are not cheap, and plumbing features, such as spa tubs, custom showers, toilets and bathroom vanities can dramatically impact the cost of a master bedroom addition project. 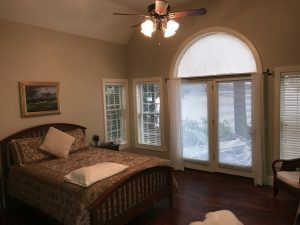 Prior to kicking off your master bedroom addition project, make a few sketches of your proposed master bedroom addition and take a few pictures of the outside of the home where you want to build the bedroom addition onto the home. Also use some stakes and string to identify the corner boundaries of the master bedroom addition. As part of the master bedroom addition planning phase, make sure you review your home’s property plot plans. Property setback requirements (Sometimes they are on the plot plan, and other times you may need to see your town building inspecting or zoning board). Anyone of these items could impact your master bedroom addition plans and may need to be addressed, or your master bedroom plans altered, to obtain a building permit. If you do see potential problems when reviewing the property plot plan and have questions, contact your local building inspector or zoning board. They can help provide you with answers and guidance on how to move forward with your bedroom addition plans. Determining the operating budget for your master bedroom addition budget is critical as it will dictate the size of your master bedroom addition and the materials and features that will be integrated into it. When developing your budget always include an additional 5-10% for contingencies such as material cost overruns and higher labor costs than originally planned. For most folks, financing will be required for at least a portion of the master bedroom addition project. Thus a trip to the local bank is usually necessary. There are a number of loan options you can consider including obtaining a home equity loan, or a new and larger mortgage altogether. What is the correct choice depends upon your personal situation, so there is no one right answer for all situations. When designing and developing your master bedroom addition plans, you may need to enlist the services of an architect to develop a formal set of house addition blueprints. Though a floor plan with dimensional information is helpful, it is typically insufficient for pulling building permits. Cross-sectional construction views are also required. In addition, tying a master bedroom addition into an existing home from a design perspective can be complicated. Consequently, unless you have the skills to do this on your own, you will have to hire an architect. After completing all of these tasks you are now in a position to contact home addition contractors for bidding on your bedroom addition. Once you have a solid set of master bedroom addition plans in place you can then begin the process of finding a general contractor and/or subcontractors for the project. Hiring the right contractor and/or subcontractors is a critical phase of the master bedroom addition project. Who you hire as your home addition contractor could make or break your master bedroom addition plans, so it is important to fully evaluate each contractor’s bid sheet and check their references. One excellent way to locate a qualified home addition contractor is to use a national home building contractor referral company. They have a large database of pre-screened and qualified home addition contractors in their system that are located all around the country. In addition, their services are free to the homeowner. You simply fill out a free online form for your specific master bedroom suite addition requirements and they forward your information on to 3 or 4 home addition contractors in your area. The contractors will then contact you to set up a time to meet with you and review your master bedroom addition plans. When obtaining master bedroom addition price quotes it is important to make sure that they provide you with a complete master bedroom addition cost breakdown sheet for every phase of the project. The more detail in the bedroom addition cost breakdown sheet, or bid sheet, the more likely the proposal will be accurate and indicative of the true cost of your bedroom addition. To help in obtaining accurate and consistent contractor quotes, see my Room Addition Bid Sheet. 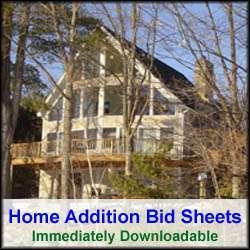 The Room Addition Bid Sheet provides a request for quote section that you can provide to prospective home addition contractors. It also includes a comprehensive room addition cost breakdown list, in Microsoft Excel format, that allows the contractor to include his projected bedroom addition costs for every phase of the project. When interviewing potential home addition contractors make sure to check their references. I typically like to check 3 to 4 references, a couple associated with recent projects and a couple associated with projects that were completed 3 to 5 years ago. This way I get a good understanding of their current work habits, as well as a sense of their quality of craftsmanship. Usually a good litmus test for evaluating a home addition building contractor is to see how long their reference list is. The longer the reference list the home addition contractor provides to you, the higher the likelihood that he has a solid reputation. A long reference list also helps to get a feel for how long he has been in business and his level of pride in his work. Finally, it is important to remember that the cost per square foot for a master bedroom addition is typically higher than building a new home altogether. The reason for this is that a master bedroom addition requires additional work and time to tie it into the existing home. In addition, a new home construction project offers economies of scale. With a master bedroom addition you may be adding only a few hundred square feet of new living space, whereas with a new home construction project you may be building 2,000 to 4,000 square feet of living space. So with proper planning and upfront conversations with banks, architects and building inspectors your chances of a successful master bedroom addition project are improved. Just remember, however, that with any home addition project your family will be tested. No major home remodeling project is headache free and there will always be the occasional setback, regardless of the upfront planning. However, with the upfront planning outlined above your ability to minimize the setbacks and to power through the occasional difficulties during your master bedroom addition project will be greatly improved. For more help on building a master bedroom addition, see HomeAdditionPlus.com’s Room Addition Bid Sheet. The Room Addition Bid Sheet provides you with the knowledge and information on how to plan a room addition project, and what to look for when hiring contractors. It also includes a detailed cost breakdown table and a spreadsheet for estimating your own new master bedroom addition building costs.